What’s so special about this dip? Seriously though, Layered Taco Dip should come with a warning because once you start eating it, it’s hard to stop. One scooped chip after the next. There’s something about it being a perfect blend of flavors from the beans to the sharp cheese to the tangy-spicy Greek yogurt layer. Of course, it doesn’t stop there. 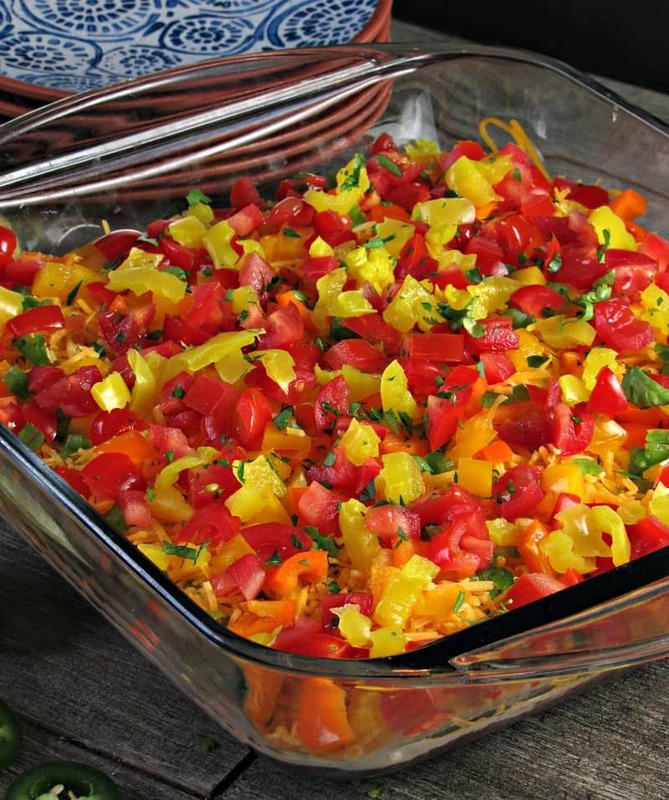 There’s another layer of fresh tomatoes, bell peppers, banana peppers and often diced avocado as well. 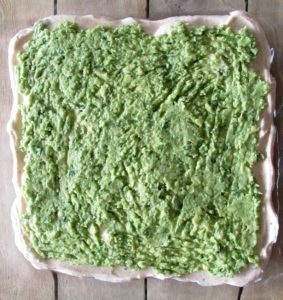 I’ve been making a version of Layered Taco Dip for a long time. Originally it was just seasoned refried pinto beans, topped with full-fat sour cream, some sharp cheddar cheese and a layer of salsa from the jar. The only ingredient that remains from that um, recipe (using the term loosely) is the cheese and the margaritas we drank with them. Somewhere along the line I started using refried black beans. The flavor is better and I *think* they’re a tad healthier. Gone is the sour cream because plain Greek yogurt with Hidden Valley seasonings is just as delicious, has less calories and way more protein That’s a win in my book. Tip: Replace sour cream with plain Greek yogurt whenever you can. Sour cream has less than 5 grams of protein. 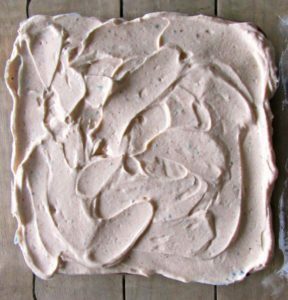 Plain Greek yogurt has a whopping 18 grams (1 cup serving each) and far less calories, too. My daughter and I have experimented with toppings: if I don’t have avocado, we skip that layer and sometimes we add black olives – yummmm. It’s a dip that’s simple to customize as you like. I used to use Fiesta Ranch Dip mix until suddenly I couldn’t find it anymore at the grocery store. Spicy Ranch is just as good and now I use them interchangeably, depending on what I have on hand. 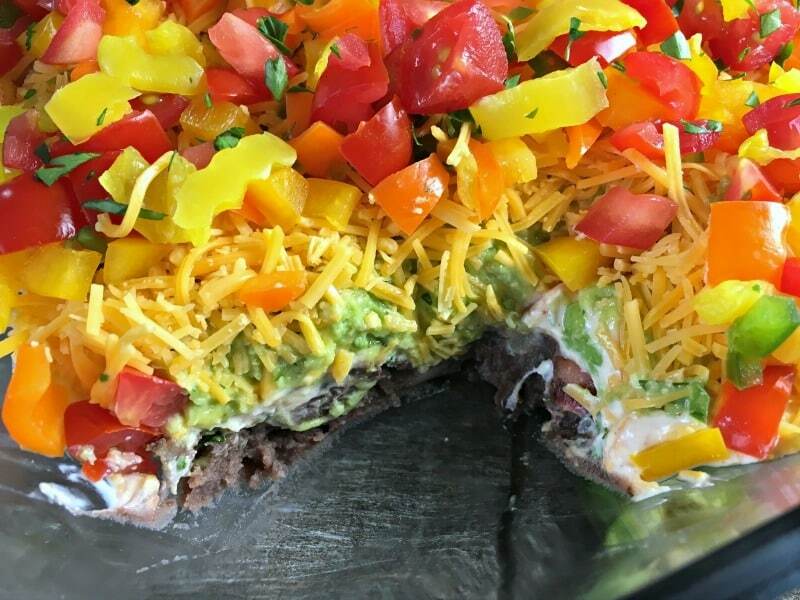 We work together on the Layered Taco Dip, dividing chopping and mixing tasks almost without words and in just a few minutes the dip is in the refrigerator chilling. Sometimes we don’t wait for it to chill and pop it into the freezer for a few minutes. Now that’s impatient. Spread the beans onto the bottom of the dish. In a bowl, combine 1 ½ cups of plain Greek yogurt and 3 1/2 tablespoons of Hidden Valley Spicy Ranch (or Fiesta Ranch) seasoning then spread it over the top of the refried beans. Next mash the avocado in a bowl using a fork then add a tablespoon of cilantro, a tablespoon of plain Greek yogurt, the lime juice and a sprinkle of salt and pepper. Stir to combine then spread as the next layer. 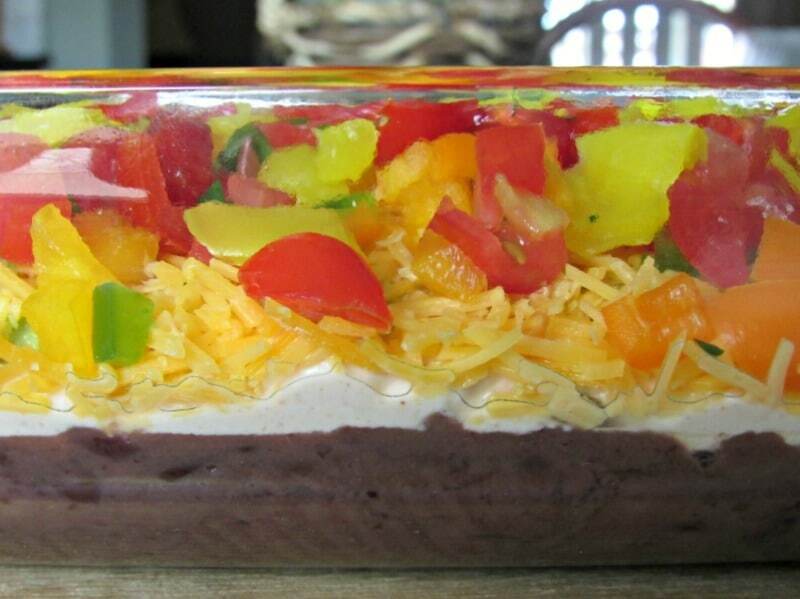 Sprinkle the cheese over the top of the avocado mixture, then add the bell, jalapeno and mild peppers. NOTE: the avocados were smaller than I realized. That layer should actually come to the edges like the others. Layer the tomatoes, garnish with cilantro then cover and refrigerate at least an hour. 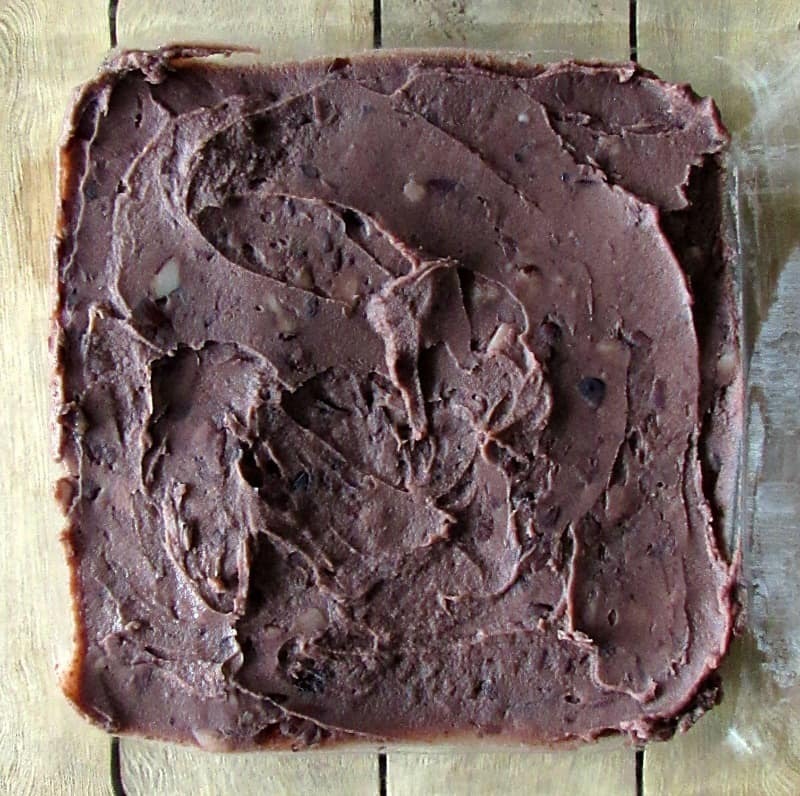 The ingredients and amounts are loosely written. Feel free to swap in or out, add more or less as you like. A 9 x 9 pan (or slightly larger) works well with the amount of the ingredients. 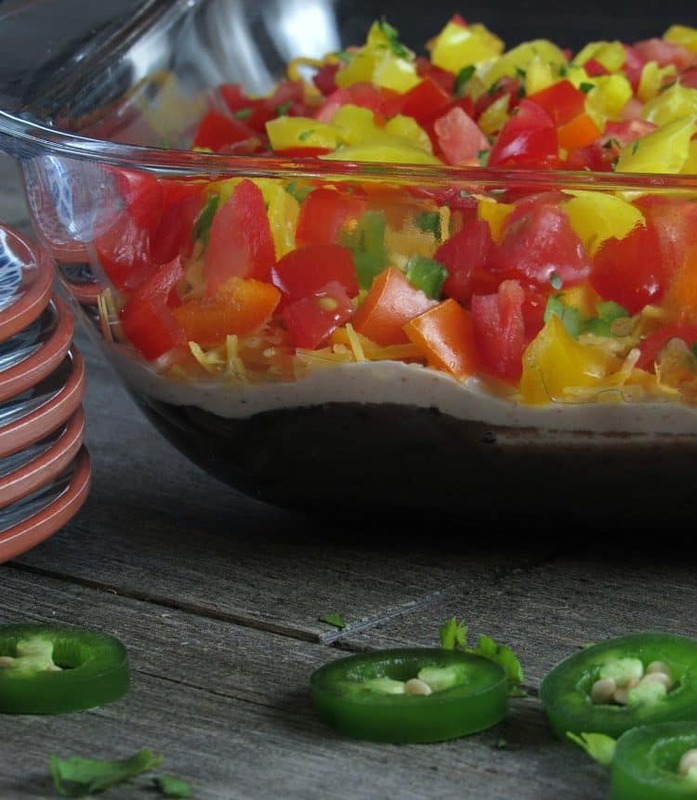 Layered Taco Dip is a popular dip year-round. 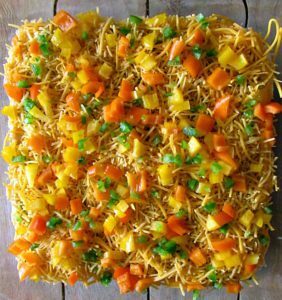 It’ll definitely be on our menu this Memorial Weekend as either an appetizer or side dish with hot dogs and hamburgers which, incidentally will also be on the menu. If you’re looking for a cocktail to sip with this Layered Taco Dip, a Grapefruit Margarita is my choice. Enjoy the dip and the time with family and friends. Spread the refried black beans on the bottom of the pan. In a bowl, combine 1 ½ cups of plain Greek yogurt and Hidden Valley Ranch seasoning then spread over the top of the refried beans. Next in another bowl mash the avocado with a fork then add 1 tablespoon of cilantro, 1 tablespoon of plain Greek yogurt, the lime juice and a sprinkle of salt and pepper then spread as the next layer. 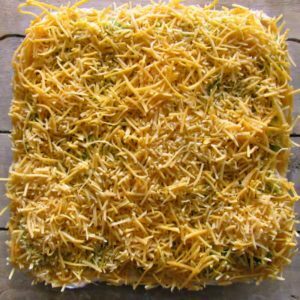 Sprinkle the shredded cheese over the top of the avocado blend. Next add the chopped bell peppers and top with jalapeno and mild peppers. This is certainly going to be made this weekend. It looks so darn good…pretty as a picture! 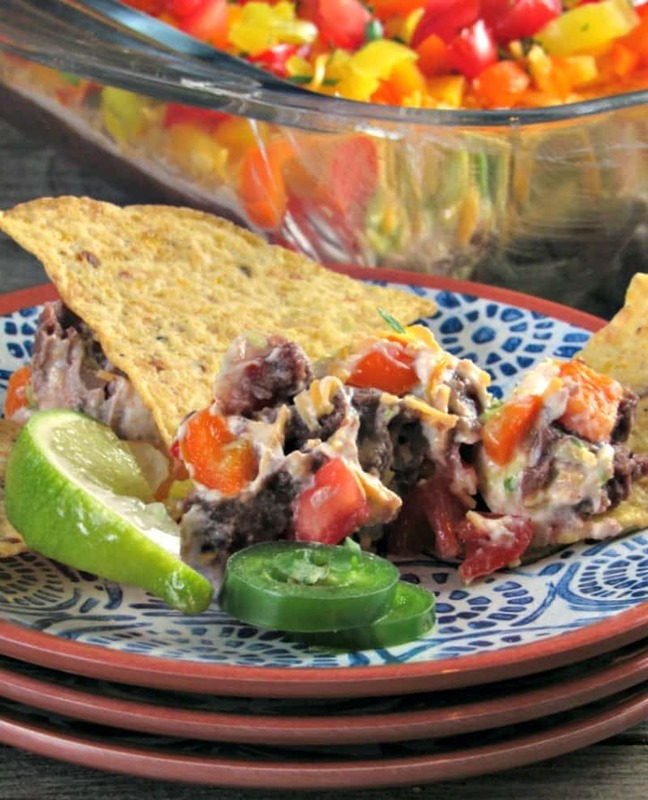 I love the refried black beans and seasoned yogurt ideas! Sounds so “healthy”. Pinned. Thanks for sharing. Happy and safe Memorial Weekend! 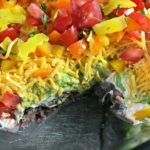 Love this layered taco dip!! I usually add a little fresh squeezed lime to the top. Definitely making this weekend! Great minds, eh? This is my all-time favorite summer dip and a little fresh squeezed lime juice can only make it better. Love how lime juice brightens flavors! 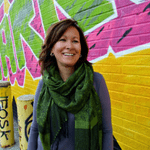 Thank you – love the idea – enjoy the dip!